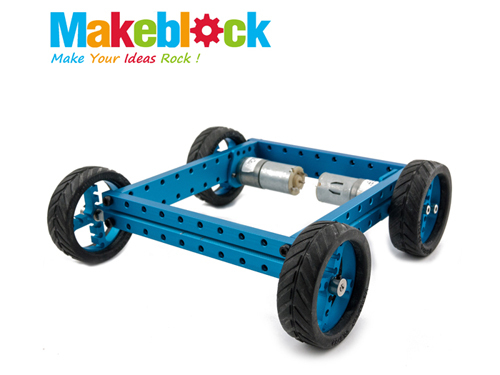 Makeblock takes the pain out of building the mechanical parts of your project. Think of these as "adult" Legos--instead of snapping the parts together, you bolt them together. You don't need a full machine shop to do this, just a screw driver and a few simple hand tools will do. The main parts of this kit are made of 6160 aluminum, cleverly designed threaded slots allow you to joint them in any position along the slots using the included screws, without using nuts. This platform contains basic structure parts, transition parts, motors, brackets, etc (see complete parts list below). This platform is open, compatible with many industry standard parts, and it's also compatible with Lego bricks (the basic hole distance in Lego and Makeblock are both 8mm, attach via screws). This 4WD kit is not just the 2WD kit with 2 extra motors. In fact, this kit have enough parts to build a pair of 2WD robots! This is a great kit for those who know they'll want to expand their projects, and could use the extra parts to explore their creativity. Acrylic Boards for connecting Arduino and battery boards to mechanical parts. Free shipping is included, but due to the weight of this kit, it will be shipped via Fedex Ground. For more info on these awesome kits, please see Makeblock's overview. Assembly directions and sample Arduino code is also available.